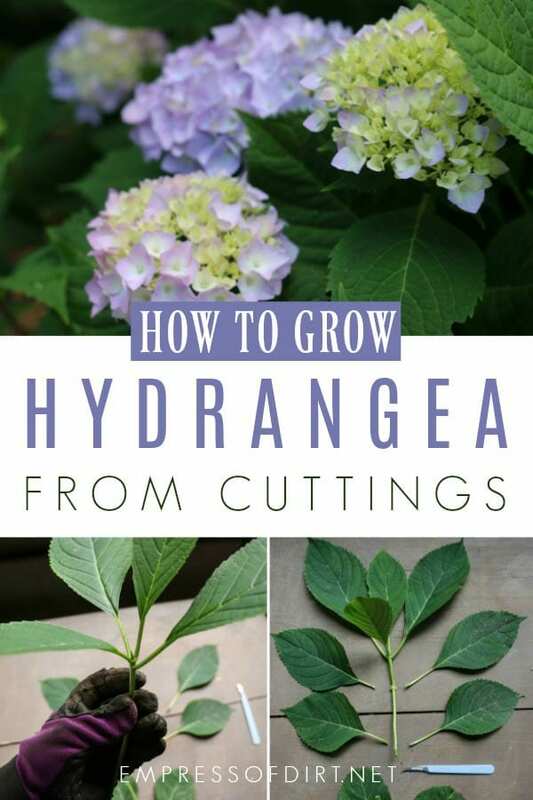 Would you like to grow new hydrangea plants from the ones you have? This shows you how to take softwood cuttings in the summer and grow them on for new plants. 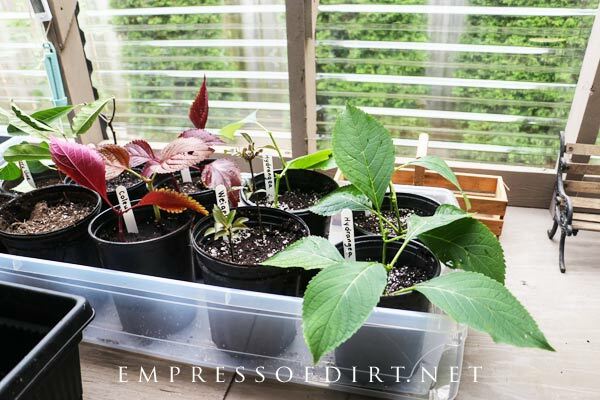 This method works for many plants that are listed here in this basic tutorial on softwood cuttings. 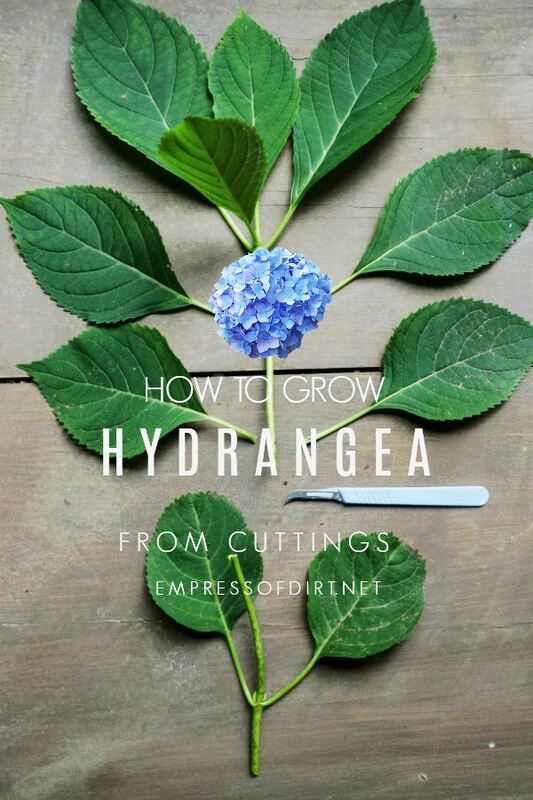 Summer is the time to take softwood cuttings to grow new hydrangea plants. You can find a list of plants to propagate from softwood cuttings here. New growth is too green and will bend but not break. Softwood will snap when bent. This is just right. Hardwood is too woody to snap. You can still propagate these as well. Depending on the plant, you may choose lateral (side) or apical (main) shoots. The cuttings should come from new (current year’s) growth on young and vigorous plants. Because home propagating can be hit and miss, I like to take several cuttings to ensure I get at least one that thrives. Here in Ontario, the cuttings taken in mid-July are quickest to root. 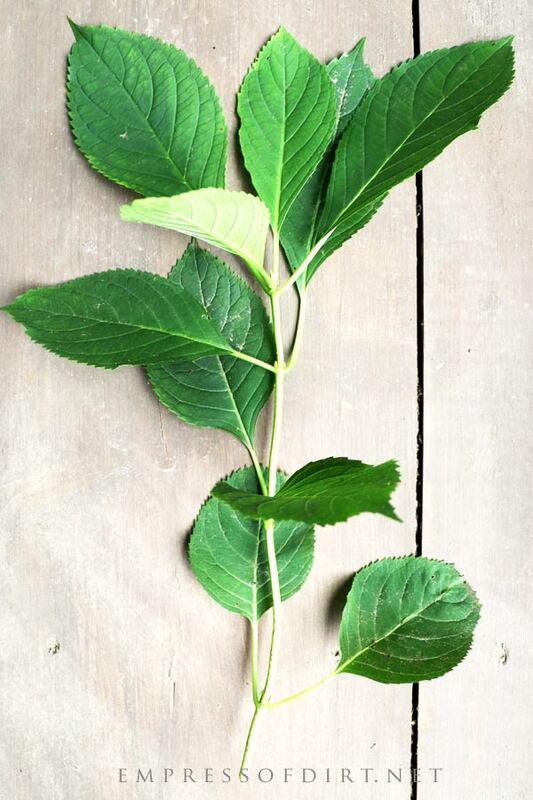 But you can still take cuttings right through until fall, using anything from softwood to semi-hardwood or hardwood. These are two of my favourite books on plant propagation. They have photo tutorials for growing plants from a variety of methods. Once you know the basics, it’s super fun and addictive! If you have access to used books, also look for The Plant Propagator’s Bible by Miranda Smith (Reader’s Digest). It’s a small book and packed with great info. Select your donor plant the day before you take cuttings and water the roots deeply if needed. 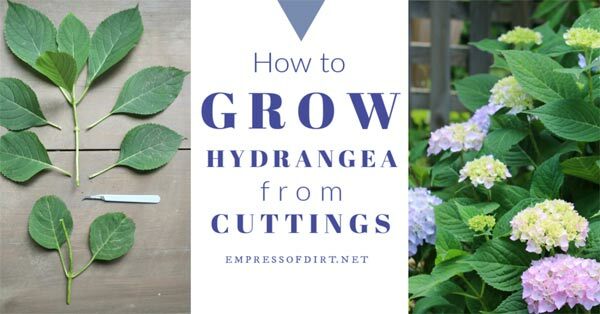 Take your cuttings in the morning when the plant is nicely hydrated. Before taking any cuttings, get your pots and supplies ready. 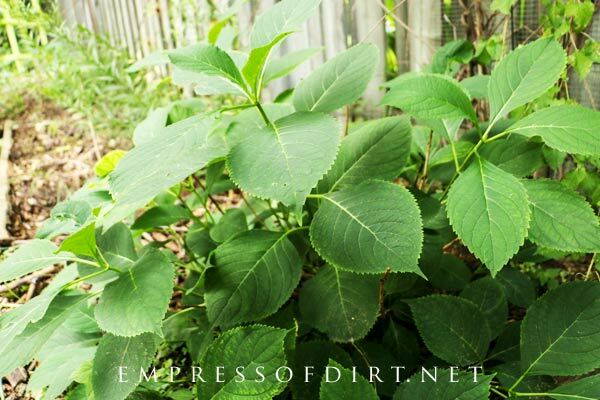 You should get the cuttings trimmed and planted immediately after removing them from the donor plant. Cuttings do best with consistent moisture, so I prefer to use plastic rather than clay pots if I have some available, since clay dries out faster. But, if you can check on your plants every day, either will do. Use pots at least 6-inches wide and deep. If you’re using wider pots, you can put several cuttings in each one. Fill pots with potting mix made for container plants (no added fertilizer). Gently press down the container mix (it tends to be a bit too fluffy) and top it up so it’s an inch below the lip of the pot. In the photos here I initially set my pots in shallow tubs, but will ultimately set them in clear, deep totes with lids on. Now you’re ready to take your cuttings. This video shows how I root hardwood cuttings. It’s the same method, just done at a different time of year. Here’s my hydrangea. It’s a fairly young plant. Ideally, the stems you use for cuttings are the thickness of a pencil or more. Never take cuttings from a plant that is weak, unhealthy, or otherwise diseased. Healthy, robust plants provide the best cuttings. Always clean and disinfect your pruners first. And repeat if you are taking cuttings from more than one plant. Use shoots that are as thick as a pencil or more (ideally) and do not have any flowers on them. Count 4 leaf sets (minimum) down from the tip of the stem to locate your cutting point. Cut ONE INCH BELOW the 4th leaf node (the bump on the stem just below the spot where the leaves meet the stem). I didn’t have any shoots available that were pencil-thick, but they should still do fine. Because it’s still summer, there is time for the roots to form before winter. TIP: If you’re too late for softwood cuttings, you can also root semi-hardwood and hardwood cuttings in late summer and fall. The method is the same as you see here. The difference is, hardwood cuttings are tougher but can take longer to grow. 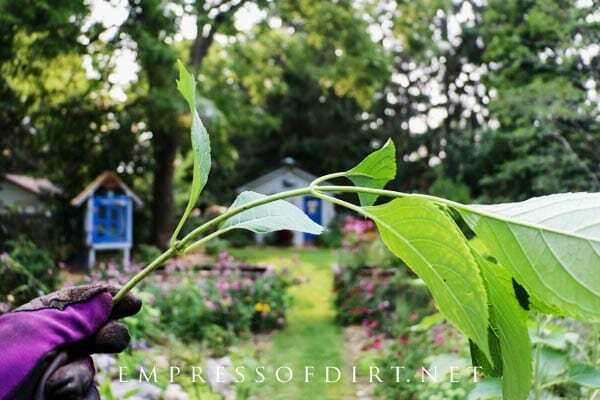 See the hardwood cutting propagation tutorial here for instructions. I do not always cut my cuttings the same way because I like to experiment, but there is one basic formula that works well. Start by looking at your cutting. We’re going to remove most of the leaves. There’s a method to it, so keep reading. 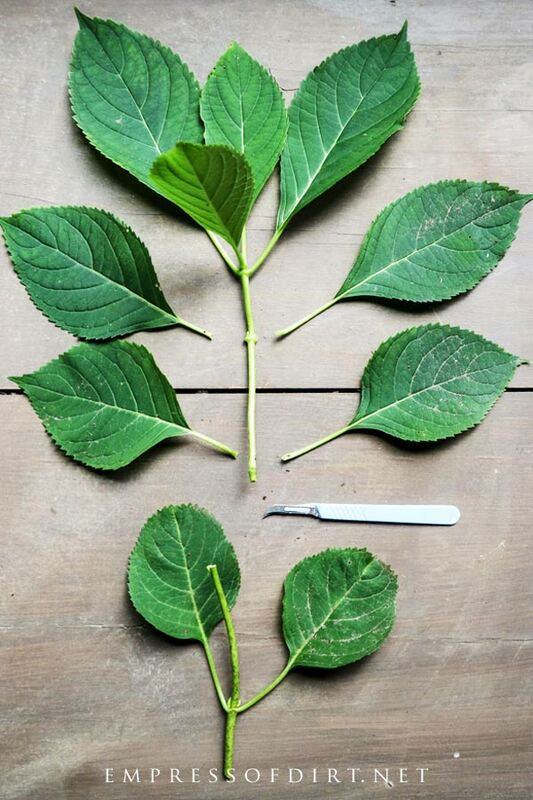 In this next photo, the lower two sets of leaves (four leaves total) have been carefully removed with the scalpel. You can also pull them off by hand. It’s the nubs of the leaf nodes that grow roots so you want to be careful to leave them intact. By burying this cutting deeply in the potting mix, with rooting hormone on the nodes, we’ll have a nice long root zone. In addition to removing the lower leaves, you can now make a fresh cut RIGHT BELOW the lowest leaf node, removing that extra inch we allowed for with the original cut. Next, we take care of the top of the plant. In this next photo, there are four leaves total. There are two lower leaves in a pair—we’re going to keep those leaves. If they are large, you can cut them with clean scissors, leaving just the lower half of each leaf. Right above them is the newest growth: two more leaves and a tiny sprout. These get pinched off. By pinching off the newest top growth, the plant will eventually produce side growth, so you don’t end up with a bean-pole of a plant. If you would like to see another example, this article on softwood cuttings also has diagrams of each of the basic cuts. 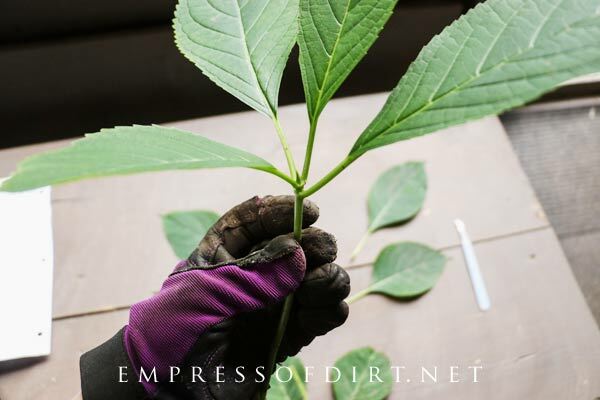 With a quarter teaspoon of rooting hormone on a clean dish, dip/roll the lower two leaf nodes (where we removed the two pairs of lower leaves) in the powder and tap off excess. Use a pencil to create a deep hole in the potting mix. Bury the cutting two leaf nodes deep. If you’re using a smaller pot, put the cutting in the middle. If you have a larger pot (8-inches or more), you can put up to 4 cuttings in, positioning them around the inner sides of the pot. 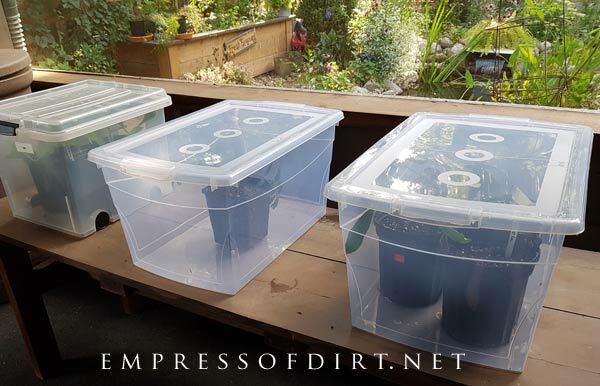 During summer and fall, the ideal setting for encouraging root growth is to keep the cuttings in a clear, deep tote with a lid, out of direct sun. You want a humid environment and even moisture in the growing medium. If the underside of the pots receive heat (without any risk of drying out), the roots will form faster. It’s fine to keep the lid on and let the humidity build up in the tote until it’s time to get ready for winter. Step 7 – Did it Work? It’s hit and miss with homegrown cuttings. We have so much variation with the source plants, when and how we prepare the cuttings, and the conditions they are nurtured in that it’s hard to know why a cutting did well or not. That’s why I start several of each type, hoping for at least 1 good one, and perhaps several. 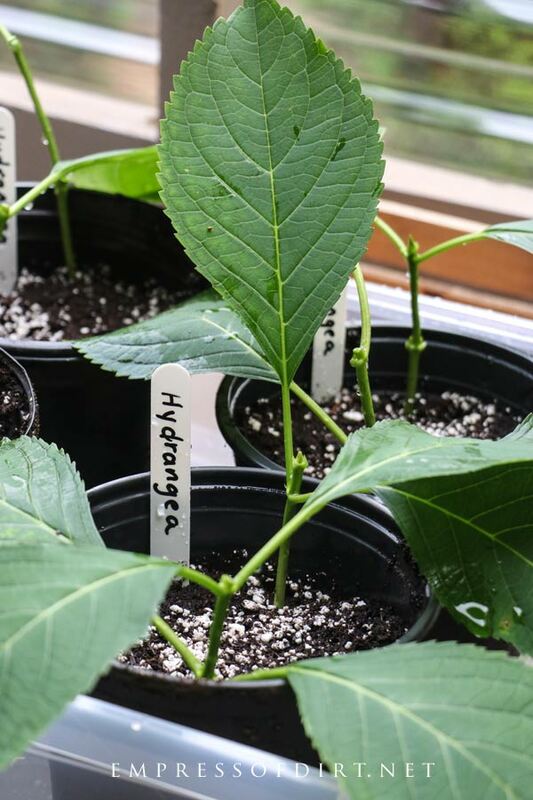 In the first week or so, your cuttings may slump over. If you prepared them properly (with the right cuts and rooting hormone) and they have humidity in the tote, they should revive. This can take a week or more. Some cuttings look good the whole way along. Others may suddenly die. Just roll with it. After several weeks, check for signs of new growth. Depending on how close we are to fall, you may see different things. The most obvious is new green growth up top. If you are using smaller pots, you may even see new root growth by the drainage holes. But either way, upper growth means the roots have expanded and your cutting is doing well. Closer to fall (or in fall), the leaves may turn colour. But as long as they are not brown and wilting, your cuttings are probably doing fine. If I have room, I tend to hang onto the slower cuttings as well. If they still appear healthy, they may just take longer than the others. And sometimes, as in life, it’s the slower ones that end up being the best ones. If you ever notice signs of disease—wilt, fungus, mold—abandon ship. Properly dispose of the plants, disinfect your supplies, and try again another day. What you do next depends on your situation. If you have a greenhouse, you can move the tote in there until spring. Alternately, if there’s enough new growth and you have at least 8 weeks before first frost, you can plant your cuttings in the garden or move them to a larger pot. You can also overwinter the tote in a sheltered location in a shed or outdoors, by first getting the cuttings used to fall conditions (lid slightly off, outside). If I don’t have totes available, I put the pots in a sheltered spot under a tree and cover them in deep straw. Be sure the soil never dries out or freezes, and gradually reintroduce the cuttings to light and outdoor conditions as spring progresses. I live in MD at the PA line (Mason/Dixon) and have several hydrangeas, a few years old now, but they don’t bloom. I thought I had to wait up until they matured, but they are about 5-8 yrs old. I get large beautiful foliage, but no blooms. 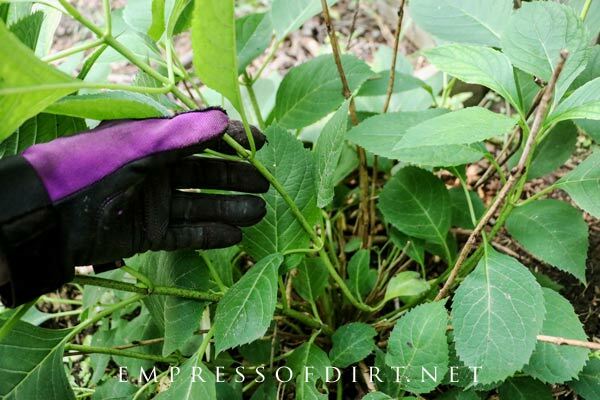 In the fall I have tried pruning back hard leaving just 6-8 ” stems and lightly pruning leaving 12-14″ stems, but the results are the same….they grow back hardy, large beautiful leaves, but no blooms. What am I doing wrong? Thank you for clear step by step and what to expect directions. like the if it does not grow, live with it, no big problem. I am not into hydrangeas, the other plants interest me and who knows, someday I might change my mind about them. have a small yard in middle of woods so no room for large plants.